Told you we were done slacking! Asics Tumblina is next up on our 2014 Shoe Series. We started with the Asics Cheer 7 and then went to the Zephz Firefly. Check them out if you haven’t yet! 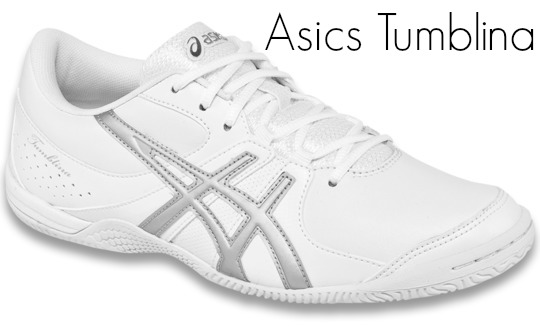 If you’re looking for an amazing indoor and outdoor shoe for this upcoming cheer season, then look no further than the Asics Tumblina. The seriously awesome Tumblina is brand new for Asics; with its amazing sleek design, it's bound to help you be the best. First thing that is most important about this shoe is its durability. We don’t think we’ve ever seen a cheerleading shoe that is this durable. Which is great for all of those outdoor practices and football games you’ll need them for. They’ve added a great rubberized outsole and a stitched down toe bumper to assist in giving the best durability possible. 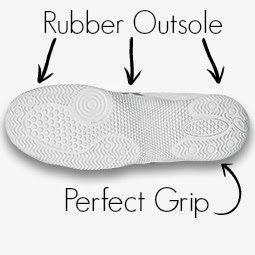 Not only is does the rubber sole help them hold up through the intensity of cheerleading, but it provides a much better grip for those incredible stunts. Because this shoe is unlike anything we’ve seen we obviously had to try them on and wear them around. We were a little skeptical at first because they fit a little narrow, but once we got the sizing down we were in love! The sole makes us feel like we’re so close to the ground it’s amazing. And obviously that is perfect for tumbling. They’ve contoured the sole to line up with your foot to fit it perfectly and add extra support. They’ve also added extra padding around the ankle and heel to provide extra comfort and eliminate the chance of blisters. It’s no mystery that the Tumblina is going to be an incredible outdoor shoe, but you obviously want it to stay as white as possible too. The synthetic leather upper on it is super easy to clean! The only thing you’ll need to do is take some warm water and soap to them and boom, they’re clean. Just because they’re an indoor/outdoor shoe doesn’t mean they’ve added extra weight to it. It weighs in at only 7.6 ounces which is just too awesome for words. Like we said earlier, the Tumblina fits pretty narrow in both Womens and Kids sizes. 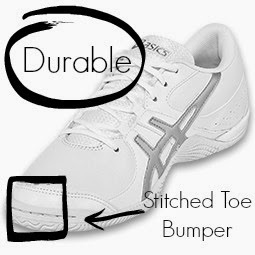 And like the majority of cheerleading shoes out there, they fit smaller than what you would wear in normal shoes. We recommend going up a half size to accommodate for the narrowness and length. Please keep in mind that everyone’s foot is different and therefore we cannot guarantee fit. So there you have it folks, that is the Asics Tumblina. What do you think of it? Next up is the No Limit Cyclone so keep checking back for our review. Do you have any questions for us? We’d love to help you out! Feel free to give us a call at 877-200-4944 or email us at customerservice@cheerandpom.com.